Neroli is the essential oil that is derived from the blossom of the sour orange tree (Citrus aurantium var. amara (flos). Sour orange you may ask? The sour orange was the original fruit that was grown before hybridizers began to work with the orange tree to make it easier to manage and pleasanter to drink. Sour orange juice is almost like a lemon juice and sour orange trees have very long thorns which make it very difficult to harvest the oranges. Probably the early use of sour orange in jellies created the sour orange marmalade that we love on our toast. Hybridizers have managed to sweeten the fruit of the orange tree. They have also eliminated the thorns. A tree we had in our yard when we lived on Pine Island, Florida, died back and sprouted from the old sour orange tree roots. It had three inch long thorns and was very unpleasant nearby the back entrance to our house. We finally had to cut it down. But the scent of the new flowers was unsurpassed. Even now I love to walk through orange groves when the trees are in bloom. It is a heady experience. As much as I love my apple orchard when it blooms, it does not equal the intense fragrance of the orange grove in bloom. 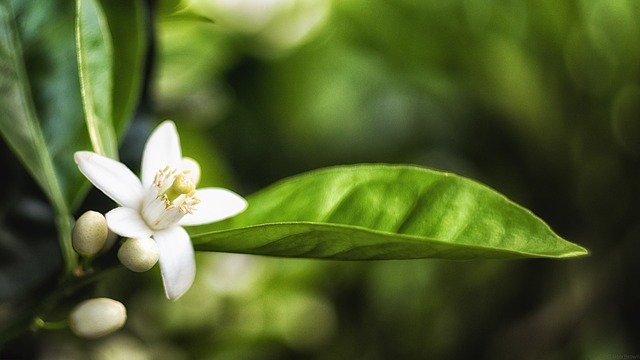 The small white flower of the sour orange tree is distilled to create the essential oil of neroli. Neroli has a very intense fragrance that is slightly bitter. The bitterness cuts through the intensity of the essential oil, but it is not sweet. It is used for a base for many perfumes and is often mixed with Jasmine or Rose. Consequently, neroli perfumes are almost always expensive. Neroli is also used in skin care, especially for oily skin. In her new book ”Harmonized Aromatherapy for Seasonal Wellness” Shanti Dechen mentions that Neroli will also help if you are agitated or worried. ** It has an uplifting quality. I love the fragrance of Neroli, so I used it in the lotion bars that I just made. *Catty, Suzanne, Hydrosols, The Next Aromatherapy, p. 85-86. **Dechen, Shanti, Harmonized Aromatherapy for Seasonal Wellness, p. 122.